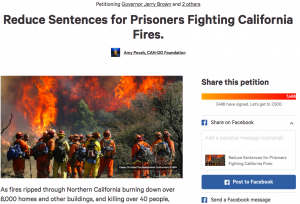 CAN-DO has launched a new change.org petition seeking clemency from Governor Brown for prisoners who risk life and limb to save the lives and homes of other California residents. We are thrilled to see it gaining so much momentum because these prisoners deserve to be rewarded for their heroic acts. We predict to hit 50K signatures by Monday, November 6, 2017! Help us get there. Help us reach our goal of 25,000 in one week to show Governor Brown how much appreciation the residents of California have for prisoners who have gone far beyond the norm to prove they deserve a second chance by demonstrating exceptional conduct worthy of a sentence reduction. Please sign and share this change.org petition to reunite prisoners who deserve a second chance.